It may sound too easy, but simple, natural foods and methods are the answer to cancer! In this fascinating book, a Western research physician teams with an Eastern Ayurvedic physician to explain how ancient "secrets" that you can do at home make it difficult for cancer to gain a foothold in your body. As you read the tips contained within—information like which household spice protects your DNA (which is where cancer starts), and how to get your own body to manufacture natural Interleukin-2 (a prescription anti-cancer drug)—you will come to realize that Answer to Cancer is more than just another cancer book. It offers simple, effective techniques to maintain health without fad diets or health club gimmicks. "The public hasn't had the first clue about how to prevent cancer. This book provides that clue and more. This offers effective prevention if people follow the guidelines." "Charming and fun to read. 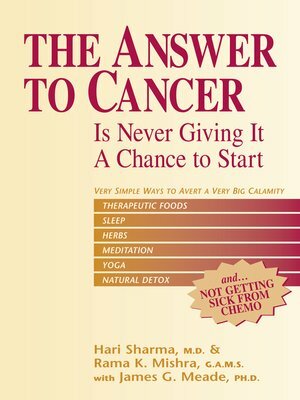 It is not just a cancer book, it gives people an opportunity to learn simple, yet powerful techniques for staying fit without tough diets or impossible workout programs."